This study aims to investigate the inflammasome response in peripheral blood mononuclear cells (PBMCs) and the expression of inflammasome components in bone biopsies from patients with chronic recurrent multifocal osteomyelitis (CRMO). The expression of inflammasome components mRNAs was evaluated in PBMCs isolated from 15 CRMO patients and 13 healthy controls by quantitative real-time PCR. The Interleukin (IL)-1β released in the medium of PBMC cultures after treatment with lipopolysaccharides (LPS) alone or LPS and ATP was measured by ELISA. 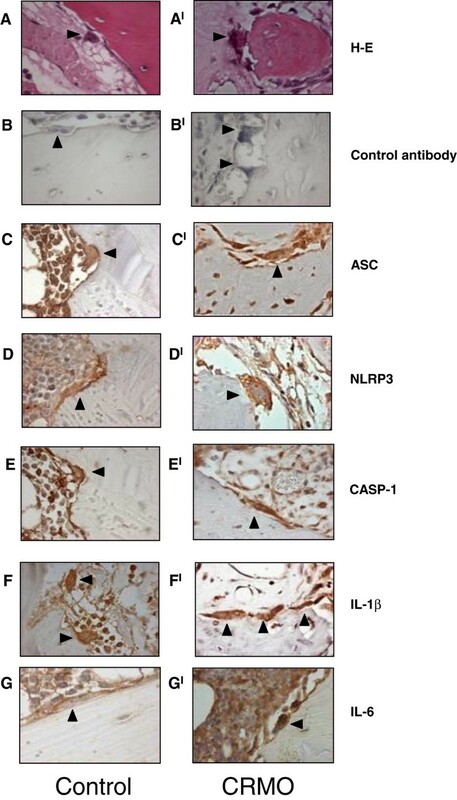 Immunohistochemical staining for Apoptosis-associated Speck-like protein (ASC), caspase-1 (CASP-1), Nod-like receptor protein-3 (NLRP3) and IL-1β expression was performed in bone biopsies from CRMO patients. mRNA levels of ASC, CASP-1 and IL-1β were significantly higher in freshly isolated PBMCs from CRMO patients in active disease than in healthy controls. CASP-1 and IL-1β transcript levels were significantly higher also in PBMCs from CRMO patients in remission compared to healthy controls. PBMCs from CRMO patients in active disease stimulated in vitro with LPS showed a significant increase in IL-1β release compared to healthy control cells. Immunohistochemistry staining of bone tissue revealed the expression of inflammasome components in CRMO osteoclasts. Our data suggest that an abnormal regulation of IL-1β axis may be involved in CRMO pathogenesis. Chronic recurrent multifocal osteomyelitis (CRMO) is a rare skeletal disorder, predominantly affecting children, that presents with bone pain, fever and sterile multifocal osteolytic bone lesions, characterized by inflammatory infiltrate and activated osteoclasts . Osteoclasts belong to the monocyte-macrophage lineage, are responsible for bone resorption and are regulated by pro-inflammatory cytokines . CRMO is usually sporadic, but there is evidence of a genetic component, as several reports described the disease in siblings and in monozygotic twins . Moreover, a monogenic disease associated with CRMO, termed Majeed’s Syndrome, is known . Although CRMO is considered an autoinflammatory disease, the pathogenetic mechanisms are still unknown. Recent findings demonstrate, in a murine model of CRMO, an inflammasome-independent role for the interleukin-1 (IL-1) pathway in the disease pathogenesis . In patients with CRMO, an imbalance between pro-inflammatory (IL-6, TNF-α) and anti-inflammatory cytokines (IL-10) has been hypothesized to be involved . Autoinflammatory diseases are characterized by deregulation of the innate immune system, often involving the IL-1β pathway . Release of IL-1β is induced by inflammasomes, multi-protein cytoplasmic complexes, composed by pattern recognition receptors, including Toll-like receptors (TLRs) and Nod-like receptors, the adaptor protein Apoptosis-associated speck-like protein containing a CARD (ASC) and pro-caspase-1, that sense microbial molecules and endogenous danger signals . IL-1β secretion requires two signals. The first signal is provided by microbial or endogenous molecules that activate NF-κB and induce, through a TLR, expression and synthesis of the inactive IL-1β precursor (pro-IL-1β). The second signal is provided by adenosine triphosphate (ATP), certain bacterial toxins or particulate matter and directly activates inflammasomes, resulting in pro-IL-1β cleavage and IL-1β secretion . The aim of this study was to examine the inflammasome response in peripheral blood mononuclear cells (PBMCs) and the expression of inflammasome components in bone biopsies from CRMO patients. Peripheral blood was obtained from 15 patients with CRMO. The diagnosis of CRMO was based on clinical presentation, laboratory and imaging data and bone biopsy. Bone biopsies (obtained from all patients, except one) showed evidence of sterile bone inflammation. At the time of the study, 7 patients had active disease, defined by patients’ reported bone and/or joint pain, increased C-reactive protein (CRP) (normal <0.5 mg/dl) or erythrocyte sedimentation rate (ESR) (normal <20 mm/h) and lesions demonstrating increased uptake of technetium-99 m in bone scan. The main characteristics of CRMO patients in active disease were: 5 females and 2 males, mean age at onset 9.57 ± 5.16 years, mean age at sampling 10.31 ± 5.72 years, number of bone lesions from 1 to 6 (median 3); 5 patients were treated with non steroidal anti-inflammatory drugs (NSAID) and 2 were not receiving any treatment. The remaining 8 patients who did not meet the criteria for active disease were defined as having remission: 4 females and 4 males, mean age at onset 7.22 ± 4.64 years, mean age at sampling 10.36 ± 5.38 years; 2 patients were treated with methotrexate, 1 with sulfasalazine and NSAID and the remaining 5 were not receiving any treatment. Thirteen healthy children comparable for age, hospitalized for minor surgical procedures, were used as controls. Blood samples were collected before they underwent surgery. They did not have evidence of infection or inflammation or increased CRP at time of blood sampling. In addition, peripheral blood was obtained also from 7 children with active juvenile idiopathic arthritis (JIA) (mean age at sampling 8.14 ± 2.54 years). Blood samples were taken after informed consent of the parents. The study was approved by the Institutional Ethical Committee. PBMCs were separated from blood by Ficoll/Histopaque (Sigma-Aldrich). Freshly isolated PBMCs were incubated in DMEM (Gibco) plus 10% FBS with 10 ng/ml lipopolysaccharides (LPS, E. coli serotype 055:B5, Sigma-Aldrich) for 3 hours, or stimulated with 10 ng/ml LPS for 2 hours, followed by stimulation with 2 mM ATP (Sigma-Aldrich) for 1 hour. Levels of IL-1β in PBMC supernatants were quantified by ELISA (R&D System). Circulating IL-1β and IL-6 levels were measured in plasma collected from patients and controls by ELISA, using commercial kits (R&D System) according to the manufacturer’s instructions. Total RNA was extracted using the Qiagen-RNeasy Mini kit (Qiagen) from 106 PBMCs and cDNA was obtained using the Superscript Vilo kit (Invitrogen). Real-time PCR assays were performed using TaqMan Universal PCR Master mix (Applied Biosystems) and the following gene-expression assays: human IL-1β, TNF-α, CASP-1, ASC and NLRP3 (Applied Biosystem). Gene expression data were normalized using HPRT, as endogenous control. Data are expressed as arbitrary units (AU) using the 2-ΔCt transformation method. Bone-biopsy specimens were available from three CRMO patients and were evaluated by immunohistochemistry. A bone-biopsy from a patient with acute lymphoblastic leukemia in remission was used as tissue control. Formalin-fixed, decalcified and embedded in paraffin bone-biopsy specimens were immunostained with antibodies to human ASC (LifeSpan BioSciences), NLRP3 (Sigma-Aldrich), CASP-1 (Cell Signaling), IL-1β (Cell Signaling) and IL-6 (Abcam), revealed by LSAB2 System-HRP (DakoCytomation) and counterstained with hematoxylin. Quantitative data were expressed as mean ± SD or as median and interquartile range (IQR). Statistical analysis was performed by the Mann–Whitney U test. P values less than 0.05 were considered significant. ASC, CASP-1 and IL-1β mRNA levels were significantly higher in PBMCs freshly isolated from CRMO patients during active disease compared to PBMCs from healthy controls. The mRNA expression of CASP-1 and IL-1β was also significantly higher in PBMCs from patients in remission compared to healthy controls (Figure 1A-D). Characterization of PBMCs from CRMO patients. (A-E) Real Time-PCR analysis of gene products involved in the regulation of IL-1β, including ASC, NLRP3, CASP-1, IL-1β and of the pro-inflammatory cytokine TNF-α in freshly isolated PBMCs obtained from CRMO patients in remission (gray dots) or with active disease (black dots) and healthy controls (white dots). Values are presented as arbitrary unit (AU). (F-G) IL-1β released in supernatants by PBMCs isolated from CRMO patients in remission or in active disease and from healthy controls, after stimulation with 10 ng/ml LPS for 3 hours (F) or 10 ng/ml LPS for 2 hours followed by treatment with 2 mM ATP for 1 hour (G). IL-1β was measured by ELISA. Black lines represent the mean value. *p < 0.05, **p < 0.01 vs healthy controls. No significant difference in TNF-α expression was observed between the two patient groups and healthy controls (Figure 1E). When we analyzed cytokine levels in plasma, we failed to measure detectable levels of circulating IL-1β (data not shown). We found that, compared to healthy controls [median value 0.156 pg/ml, Interquartile range (IQR) 0.156-0.612], circulating levels of IL-6 were similar in patients in remission (median value 0.327 pg/ml, IQR 0.156-1.825) (p = 0.14), while they were significantly increased in patients during active disease (median value 8.48 pg/ml, IQR 4.93-23.72) (p = 0.0004). To evaluate inflammasome activation in PBMCs from CRMO patients, freshly isolated PBMCs were stimulated in vitro with LPS alone or LPS plus ATP and the IL-1β released in the medium was measured. After LPS stimulation, the amount of IL-1β released by PBMCs from CRMO patients with active disease was significantly higher when compared to patients during remission or to healthy controls (Figure 1F). In contrast, cells from patients with active JIA stimulated with LPS alone produced amount of IL-1β comparable to those released by healthy controls (0.067 ng/ml ±0.061 versus 0.064 ng/ml ±0.046, p > 0.5). Stimulation with LPS plus ATP led, as expected, to a marked increase in IL-1β release, with no significant differences between the three groups (Figure 1G). In patients with active disease, IL-1β mRNA levels in PBMCs freshly isolated or IL-1β release following in vitro LPS stimulation were not significantly associated with the number of bone lesions (R = 0.480, p = 0.27; R = 0.566, p = 0.17, respectively) or ESR (R = 0.141, p = 0.75; R = 0.50, p = 0.24, respectively). In two patients, we analyzed PBMC IL-1β mRNA levels before and after (16 and 18 days, respectively) pamidronate administration: a 2-fold reduction in IL-1β mRNA levels was observed (pre-treatment 49.7 and 50.9; post-treatment 28.1 and 23.3 arbitrary unit, respectively). The presence of activated osteoclasts is a typical feature of bone lesions in CRMO. Because of their potential pathogenic role in CRMO, we performed the immunohistochemical staining of bone biopsy specimens from CRMO patients (n = 3), (Figure 2AI-FI) and from one tissue control (Figure 2 A-F) with antibodies to ASC, NLRP3, CASP-1 and IL-1β. In bone tissue from CRMO patients and one control, the expression of the three inflammasome components as well as of IL-1β was detected, demonstrating that also osteoclasts expressed components of the inflammasome machinery. Expression of inflammasome components and IL-6 in bone biopsies from CRMO patients and from one tissue control. Representative immunohistochemical staining of decalcified human bone biopsy specimens from a tissue control (A-B-C-D-E-F-G) and patients with CRMO (A I -B I -C I -D I -E I -F I -G I ). Bone sections were stained with hematoxylin-eosin, a secondary antibody only or with primary antibodies as indicated. Magnification: X63. Arrows: osteoclasts. We demonstrated an abnormal regulation of the IL-1β axis and its secretory machinery in CRMO patients. PBMCs from CRMO patients obtained during the active disease expressed higher mRNA levels of inflammasome key components, ASC and CASP-1, and higher levels of IL-1β mRNA. Moreover, PBMCs from CRMO patients, cultured in vitro, showed a higher IL-1β release after treatment with LPS alone. These results are consistent with a deregulation of the IL-1β processing machinery. Indeed, in patients with cryopyrinopathies, caused by gain of function NLPR3-mutations, increased IL-1β release following stimulation with LPS alone is a typical feature of the disease . IL-1β release can result in autocrine stimulation and in the secondary induction of other cytokines, such as IL-6. We indeed found that high circulating IL-6 levels are present during active disease. In vivo, neutralization of excessive IL-1β in cryopyrinopathies and in deficiency of interleukin-1 receptor antagonist (DIRA) results in decrease in IL-6 production [10–12]. We could not detect circulating IL-1β. However, detection of circulating IL-1β has proven to be extremely difficult even in diseases in which undoubtedly excessive IL-1β production is known to be involved, including cryopirinopathies and systemic JIA [13, 14]. Therefore, the absence of detectable levels of IL-1β does not rule out a pathogenic role for this cytokine. Indeed, satisfactory responses to anakinra have been reported in one patient with synovitis-acne-pustulosis-hyperostosis-osteitis syndrome (SAPHO) , and in two patients with Majeed syndrome . One transient response has been reported in one patient with CRMO . These observations, together with our results, point to a role for IL-1β in the pathogenesis of CRMO and further support the inclusion of CRMO in the group of autoinflammatory diseases. The higher mRNA levels of CASP-1 and pro-IL-1β found in patients during remission suggest the presence of a sustained proinflammatory state in CRMO patients. The mechanisms leading to this proinflammatory state, as well to activation of the inflammasome in vitro hyper-response are unknown: in particular, possible contribution of genetics have remained unclarified. In addition, we found high expression of IL-6 in bone biopsies from CRMO patients (Figure 2GI), suggesting that IL-6 produced at inflammatory sites may be the source of the circulating measurable cytokine in the blood. Circulating IL-6 levels were significantly higher in CRMO patients during active disease. In cryopirinopathies, in which abnormal IL-1 secretion drives the cytokine cascade and all clinical and laboratory features, IL-6 production in tissues and high circulating levels have been shown to be completely IL-1β dependent [10, 18]. We have also shown that osteoclasts in vivo express inflammasome-related proteins. This is consistent with data in the literature [19–21] and a publically available expression profile database, showing detectable mRNA levels of inflammasome components in osteoclasts differentiated in vitro. However, the function of the inflammasome in osteoclasts is not known yet. In this respect, future studies in osteoclasts from patients with Majeed syndrome might represent the ideal model to investigate, in the context of a genetic abnormality, the presence of abnormal function of the osteoclasts. We have shown increased IL-1β secretion by peripheral blood mononuclear cells of CRMO patients during active disease and expression of inflammasome components by CRMO and control osteoclasts in vivo. These results further support a role for autoinflammation in CRMO. All authors were involved in the design of the study. RS performed stimulation of PBMCs ex vivo, cytokine measurement by ELISA, Real-time PCR analyses and drafted the manuscript, under the supervision and with the collaboration of GP. AI was responsible for the collection of data and provided statistical analysis of the data. RDV and MP were responsible for Immunohistochemical analyses. LBL and AT contributed to the study design and analysis and interpretation of the data. FDB and GP conceived the study, oversaw the project and critically reviewed the manuscript. All the authors have contributed to the writing of the manuscript and have seen and approved the final version of the manuscript.